Yay the fund is getting bigger!!!! The pics of the lovely ladies and you are fantastic.....your tartan dress is amazing, the collar!!! One day to go....best of luck sweet. That tartan taffeta is pretty awesome! Our school end of year bashes were pretty low key-I must have pix somewhere. My Mama made my Year 12 one, I know that much. It was black taffeta. I must watch that movie!!! Can't believe I missed that gem! What a fantastic post, Kylie!!! I spotted you right away too:-) I absolutely loved watching all those glorious 80s fashion moments!! You are easy to spot - you've hardly changed at all! Is there a fountain of youth in the back yard? What a vision you and your besties are in taffeta! I love tartan taffeta! I can hear the rustle of all those frocks! My formal was a disaster - I cut up and spray painted a wedding dress black, wore it with shiny leopard print LEGGINGS (!!!) and had electric blue hair sticking up from my head and everyone laughed at me and I spent the night hiding in the toilets!!! Oh and my ex boyfriend turned up drunk and got kicked out! Brilliant post Kylie, love the dresses (I think I spent the 80's in a ra-ra skirt and sweatshirt!) We didn't have anything like a prom night back then, but I was at an all girls school so maybe that's why. Well done on all you've raised to date. Tartan taffeta - you rock! I put in a vote for Carrie for excellent evil prom movies filled with gratuitous death. What a girl! You all looked absolutely beautiful on prom night. I loved seeing you all dressed up in your party best. 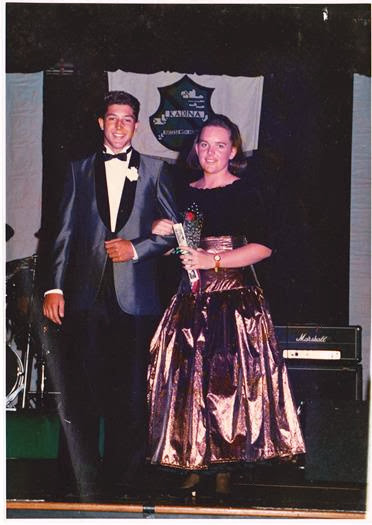 Talk about feeling old though...the prom picture I was going to send to Kylie but never found was taken in 1965!